Hurting: Can Wright Be Right This Time? Larry Hurtado has roused blogospheric attention with his adverse evaluation of the N.T. Wright’s unconventional interpretation of what the early Church believed about the “second coming” of Jesus. 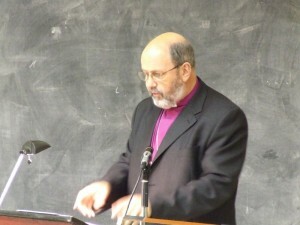 The Bishop of Durham has broached the idea before but Hurtado’s criticism his directed towards the relatively recent (2013) Paul and the Faithfulness of God. Wright contends that Paul’s teaching that God’s Spirit dwelt in the Church as his Temple could only mean one thing among Jews of Second Temple days: God had returned to dwell on earth with his people. God’s Temple was once again filled with the Glory of God. God, YHWH, had returned to his people in Jesus who was vindicated after the resurrection and that same YHWH now shed his glory on earth in the lives of the saints. Christ is the first to be resurrected and the rest of his brethren will be raised at his final appearance from heaven (the parousia). The (extended) day of that resurrection is now, but God’s promise to return to his people and dwell among them was fulfilled when he came in Jesus and continues now that he lives in his earthly temple, the church. This final event is merely seen as the completion of the renewal that has begun with Christ’s resurrection. Thus there is no “second” coming: God has fulfilled his promise to come to live with his people now. Hurtado will have none of it. Christians (like Hurtado) are still waiting for the second coming just as Paul really taught their original generation. So deep is this belief furrowed into the mind of the conservative scholar that any contrary view must be bereft of all supporting evidence. My own piece is a critical study of Wright’s claim that the earthly ministry of Jesus was seen from the first as YHWH’s “return to Zion,” . . . . I judge his claims faulty, unsupported by the evidence. Hurtado maintains that the long promised return of YHWH to Zion will be fulfilled in the second coming of Jesus. It was not fulfilled in his first visit. What I see is that the earliest use of the OT theme of YHWH’s return to Zion/Israel, in Paul’s letters (our earliest texts), posits that it is in Jesus’ “second coming” (parousia) that this is fulfilled. See, e.g., the use of such imagery in 1 Thessalonians 3:13, where Jesus will come (again) “with all his holy ones” (μετά πάντων τῶν ἁγίων αὐτοῦ), which seems to draw this phrasing from Zechariah 14:5 (one of the “YHWH’s return” passages). For further analysis of the NT appropriation of this theme, see Edward Adams, “The ‘Coming of God’ Tradition and Its Influence on New Testament Parousia Texts,” in Biblical Traditions in Transmission: Essays in Honour of Michael A. Knibb, ed. Charlotte Hempel and Judith M. Lieu (Leiden: Brill, 2006), 1-19. Surely it would be difficult to find a clearer example of inability to read the Bible. Even the most learned cannot set aside the presuppositions of their own faith when they read. Hurtado knows that the plain words of the Scriptures he quotes do not make it clear that in the writings of Paul Jesus is said to be coming “again”, a “second” time. He knows that he has to insert those “clarifying” words into the original text to convince readers he is right. We must assume that Hurtado cannot believe that the words he reads mean anything other than what he knows he must add to explain their “true” meaning to his readers. Yet without those words that he consciously adds he must suspect that some readers will indeed see that the plain unadorned evidence does truly support N.T. Wright’s case all along. It is Wright’s case that has the evidence; it is Hurtado’s claims that are “unsupported by the evidence”. Posted on 2016-02-20 22:46:12 GMT+0000 by Neil Godfrey. This entry was posted in Uncategorized and tagged Larry Hurtado, N.T. Wright, Second Coming. Bookmark the permalink. Correction: it’s by Crossley. One of the other members of the same blog as Keith and Le Donne. So when did the idea of the second coming enter Christian belief? It probably came along with the idea that the gospels were factual reports of a first coming. I wonder if the second coming is an alternative view of ‘the resurrection’, or arose out of an alternative telling of ‘the resurrection’, or vice versa – ie. the proposed second coming was presented as or narrated as a resurrection, or vice versa. The notion for a second coming could also be a post-‘Ascension’ proposal, too (which could make the supposed post-resurrection appearances a nebulous first-coming). My own view is that the events of 70 CE were understood by “Mark” as the “coming of God” in judgment upon his people and the sign that the new kingdom was now the spiritual temple, his “church”. It appears to me that subsequent readers of Mark 13 interpreted the apocalyptic imagery literally (it was originally borrowed from the OT where it described previous occasions of God coming to earth to judge nations) and the idea that Jesus had not yet returned was a necessary corollary of that literalist interpretation. It appears that the belief in a “second coming” had entered by the time Luke-Acts and John were written. Of course Paul’s churches also believed in the parousia, but it was seen as the coming, the actual appearance of the Jesus who had already come and was dwelling among them as his Temple and through his Spirit. Once Mark was interpreted literally then the idea of “two comings” entered — as per Doug Shaver. An interpretation of Mark 13 that does not require a chain of conjectures is simply that Jesus is predicting another individual. Someone who would come during the war. I think so, too. Jesus is predicting another individual (Titus) in order to contradict deliberately the Daniel prophecy about the coming Jewish Messiah. But Joe Atwill thinks that this is a Roman ironical sarcastic point. Markus Vinzent thinks that this is a classical marcionite antithesis. Even ignoring the obvious typological linkage, Roman sarcasm is a better fit. Marcion would have had no reason to celebrate the Flavian victories – the crushing of the Galilean towns, encircling Jerusalem with a wall, the AoD, the razing the Temple etc. I think that Marcion did not want to celebrate the Flavian victories. Marcion wanted to show the failure of all earthly hope (born from illusion of confusing the Son of a stranger god for the Jewish Messiah). It is clear to me that the Old Testament “Day of the Lord” is the historic, textual precursor to Jesus and the Second Coming. Many efforts were made to decouple them. By Christian NT or other writers eager to separate their vision of 1) a forgiving Jesus, from the original model of 2) a violently avenging God, returning to earth to punish and kill billions. Yet the relation is there. Though suppressed. However? If 1) Hurtado wants to argue that the first coming of Jesus did not fully accomplish the promises of the Day of the Lord, and 2) if The Jesus Blog of Keith and Le Donne et alia, wants to argue against an early, firm divinity or high Christology to Jesus? Then an early high status of Jesus at least, is in question.